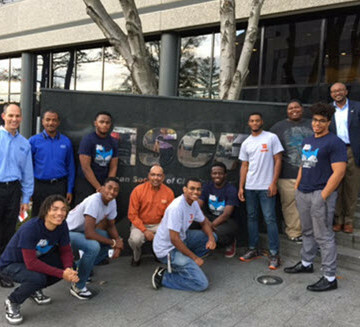 The Morgan State University steel-bridge team visits ASCE Headquarters in Reston, VA. 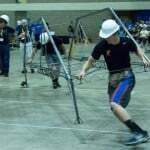 Although the National Student Steel Bridge Competition is still six months off – to be hosted in May by Brigham Young University with the help of its ASCE Student Chapter – student teams across the country have been honing design and assembly skills critical to victory. 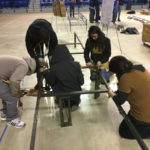 At Morgan State University in Baltimore, the team has been building camaraderie and some resume power as they assemble their bridges this year. 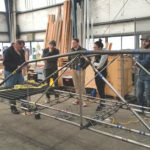 They came to ASCE’s suburban Washington, DC, headquarters in Virginia earlier this month to put on a bridge assembly demonstration for ASCE staff. 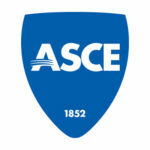 Chapter vice president Dmitri Clemons, S.M.ASCE, is a newcomer to the steel bridge squad. Growing up in Silver Spring, MD, Clemons said he took up football at Paint Branch High School, but rather than focusing on stopping the quarterback, he found himself at practices more interested in what was happening across the field, watching construction of a new school building. For a time he interpreted such interest in terms of a career in architecture, but at Morgan State, discovered that civil engineering was what he really wanted to do. Members of the Morgan State steel bridge team engage in a demo build. Killian Tyler Baptiste, S.M.ASCE, a sophomore, said he followed his uncle Albert Blake – a civil engineer working in Afghanistan – into the field. He’s already found his steel bridge experience to be a huge help when interviewing for jobs and internships. “Everybody asks, ‘What is Steel-Bridge?’” Baptiste said. “So it’s definitely a good opportunity to talk about what I’m learning. Morgan State is a historically black college of nearly 8,000 students. Hunter said the team wasn’t satisfied with its showing at last year’s competitions. Team captain Phine Ulysses has played a key role in rallying the group to improve on those results.